Updates are important part of any operating system. And, Windows updates do help to fix errors, and also add some new security features. But, installing Windows update is headache. Many users are facing multiple errors while installing Windows Update. Though, Microsoft has added troubleshooter in Settings App for each Windows problem. And, there is an update troubleshooter also available. But, for some users Windows Troubleshooter is showing “Potential Windows Update Database Error Detected” message. If you’re facing similar issue, and unable to Update Windows. Then, you have to try all mentioned solutions in this article. Because, this error comes with many error code. So, there isn’t any specific solution available for this problem. Before installing update, Microsoft download updates in your local disk. And, if due to some reasons, update files got corrupted. Then, this “windows update database corruption” problem occur. According to a Windows Forum expert – this message appear, when OS cannot able to access Windows folder. Whatever is the reason, just try out all these solutions. And, if problem doesn’t get resolved, feel free to Comment. 1 Solutions : Potential Windows Update Database Error Detected. 1.1 1. Perform SFC Scan. 1.2 2. Run DISM Tool. 1.3 3. Delete Corrupted Update Files. 1.4 4. 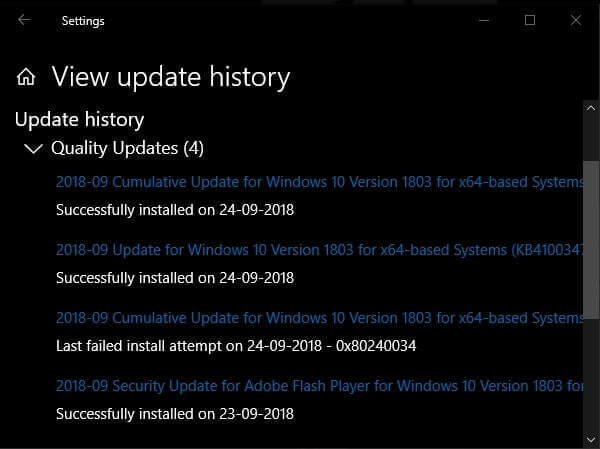 Reset Windows Update Components. 1.5 5. Download Update Manually. 1.7 7. Install Latest Version of Windows. Solutions : Potential Windows Update Database Error Detected. IMPORTANT: While trying out these solutions. You have to open Command Prompt(Admin) many times. So, here is the small guide to open CMD(Admin). To open Command Prompt, Click on Windows Icon (Start button). Search for CMD. From search results, right-click on command prompt and then click on “Run as administrator”. This could be possible that, this error is occurring due to some missing or corrupted files. Windows comes with an built-in tool called “System File Checker”. That scan your Complete Windows. And, help you to restore corrupted and missing files. 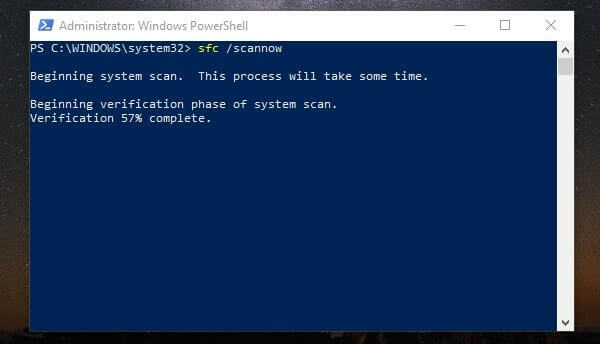 This tool also does scan Windows Update related folder. 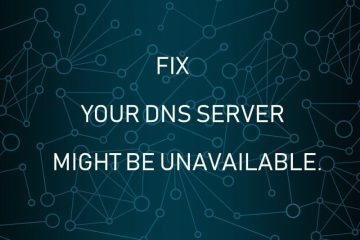 So, it could possible that this tool can help you to fix this error. 1. Run Command Prompt as an Administrator. That’s it. Now, you just have to wait for the process to get Complete. The SFC tool will scan all your protected system Files. And, will replace corrupted system files with the cached copy. That is located in Windows\System32\dllcache folder. Well, Microsoft suggest to run “Deployment Image Servicing and Management (DISM)” first. But, in this case, if SFC scan doesn’t resolve the error – potential windows update database error detected not fixed. Then, DISM will help you to check system health and restore missing files. 2. To run DISM tool type the following command and press enter. The whole process will take time more than SFC Scan. So, don’t close Command Prompt Window. Just wait for the DISM Scan to get Complete. Note: DISM Scan uses Windows update for the required files to fix file corruptions. And, this error is coming due to some Windows Update issue. So, you have to use Windows Installation Media such as Windows DVD. As the source of files to fix corrupted files. 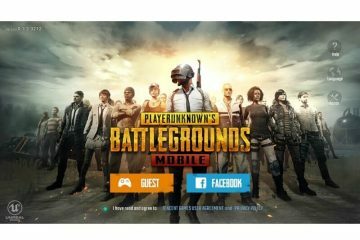 There is an detailed article available on Microsoft site regarding it. 3. Delete Corrupted Update Files. As I mentioned above, “Potential Windows Update Database Error Detected” problem occur when, updates file got corrupted. Windows tries to install those update again and again from those corrupted files. And then, Windows troubleshooter show this error. 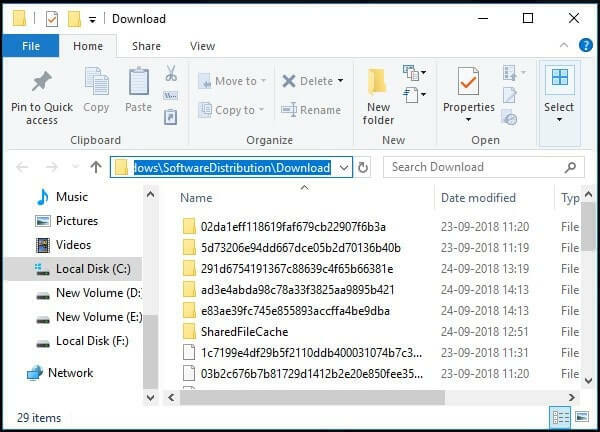 So, in this solution, we are gonna delete all downloaded update data. And, then after a quick restart, Windows will start downloading updates again. You just have to delete content of Download Folder. Make sure you’re logged in with administrator account. Else, you can’t able to delete. Once, you done deleting data. Restart Windows, and then Go to Settings App > Update & Security. Click on Check for updates or install updates. If downloaded updates files are ok, and, update components are faulty. Then also, Update troubleshooter shows “Potential Windows Update Database Error Detected” message. But by resetting update components you can fix this error message permanently. And, if you don’t want to delete downloaded updates. Then, you can rename Software Distribution and Catroot2 folder. But, you have to stop few update components before renaming folders. Open Command Prompt as Adminstrator. 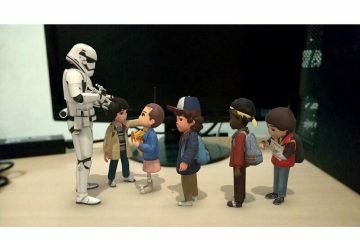 And, give the following commands, one after one. And, press enter after each command. 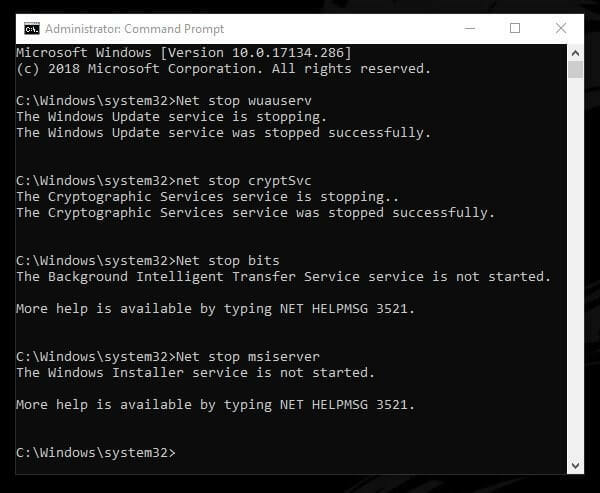 These commands will stop Windows update service, Cryptographic, BITS and MSI Installer and server. Rename Catroot2 and Software Distribution Folder. 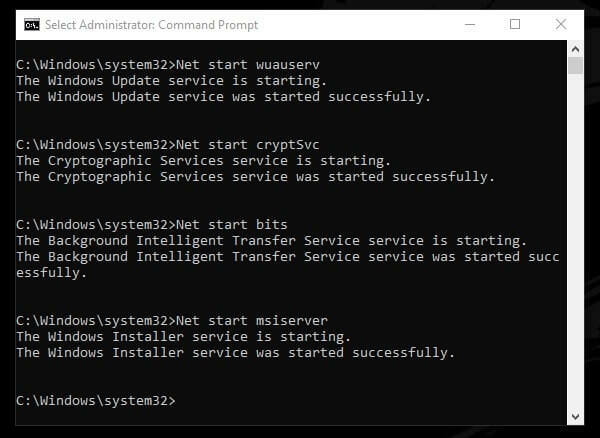 Open Command Prompt (Admin). And, give these two commands to rename folder. You can also rename these folder manually. By reaching these directory. These two commands will add .old extension to both folder. So, Windows update service will ignore these folders. And, will create new folder and download update in it. Note: If you’re unable to rename Catroot2 folder. 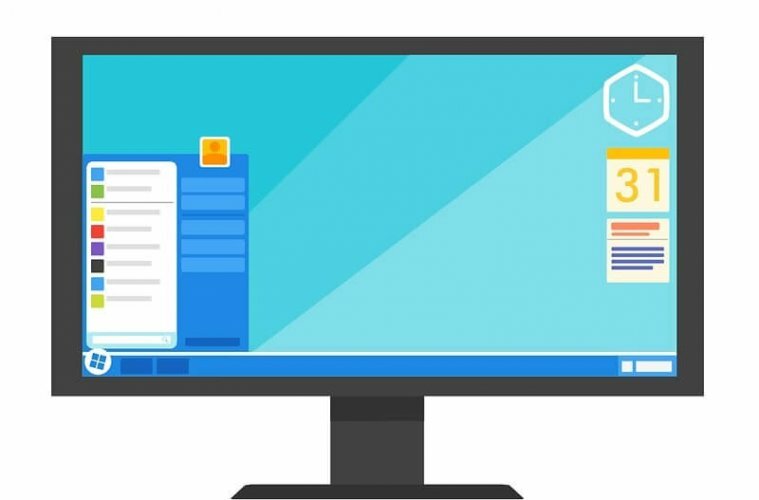 Boot your Windows into Safe Mode. To Start Windows Update Components that you have stopped. Give these commands in command prompt. That’s it. Now, just restart your Computer once. And, after that, you can update Windows normally. “Potential Windows update database error detected” error appear when updates failed to install. Which can be due to several reasons. Maybe updates files doesn’t got downloaded properly. Many users doesn’t know that, they can download update file manually. And, then install updated without any interruption. Yes, you can download any update files from Microsoft Update Catalog. First, you have to find out, which update got failed to install. That you can check by going into update history section. Open Settings App (Win + I key) > Click on Update & Security > View Update History. 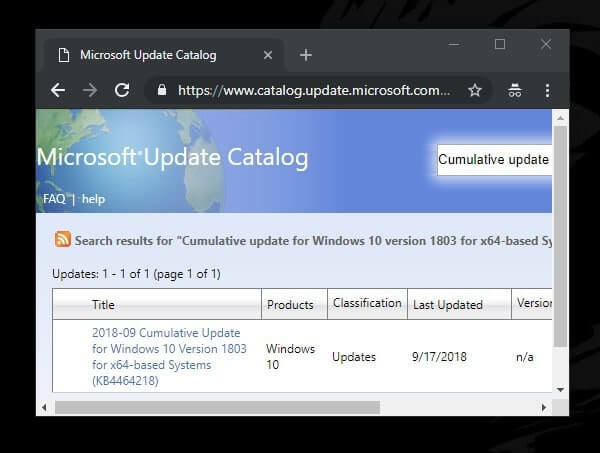 As you can see in below screenshot, “Cumulative update for Windows 10 (KB4464218)” failed to install. So, I am going to download it manually from Microsoft Update Catalog. You have to do the same. 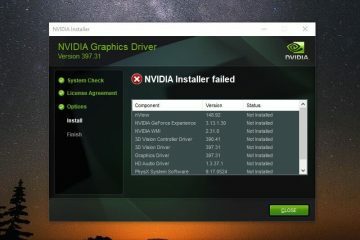 First find out which update failed to install. Then, open “Microsoft Update Catalog” site. Search for update (Enter full name of update). You have to restart Windows after complete installation of Windows Update. Resetting Windows is basically a re-installation of Windows process without a disc. If this error is bothering you too much. And, you are still unable to install Windows updates. 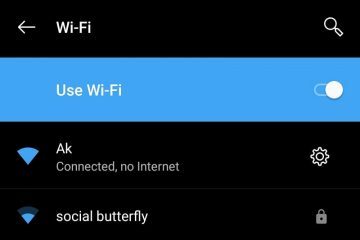 Then, you can use this option of Windows. 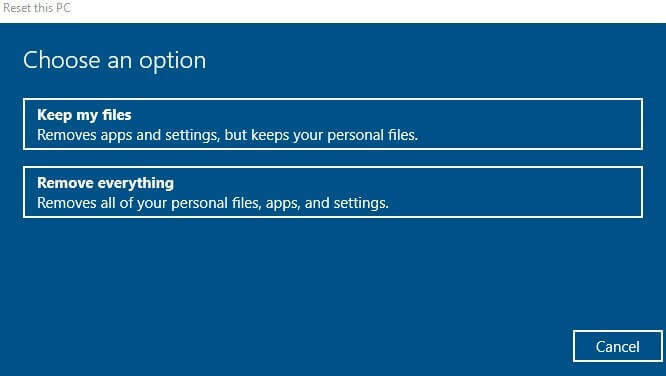 Before resetting Windows, it will ask you to keep personal files. Or, you can remove everything and clean install Windows. 1. Press Windows + I key to open Settings App in Windows 10. 2. Go to “Update & security” > Recovery in settings App. 3. Under Reset this PC section, click on Get started option. Now, follow instruction mentioned on appeared Windows. You will get option to keep or remove files. Personally, I suggest to remove, it will help you to get rid of corrupted files. But, don’t forget to make backup of your important data. 7. Install Latest Version of Windows. If nothing works, and, even after resetting same “potential windows update database error detected” occur. Then, you need to create latest Windows 10 installation media. And, then you can install Windows Again. To create installation media you have to download media creation tool from Microsoft site. 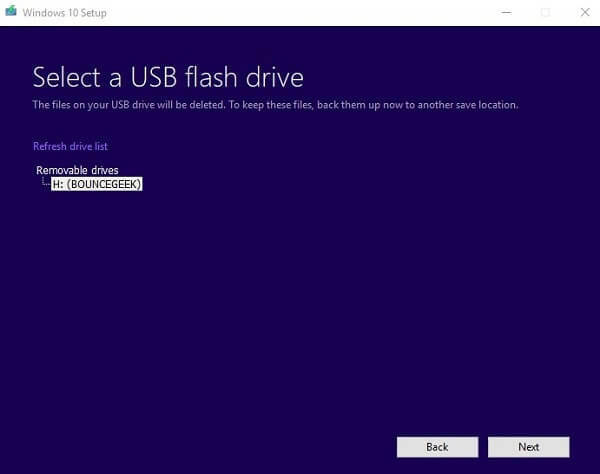 That will help you to create bootable USB drive of latest Windows ISO. Or, you can directly download Windows Insider Preview ISO. And, can create bootable media using Rufus software. Though, there are tons of guide available on internet. On how to download and install latest version of Windows 10. So, I am not writing about it. Though, if you want, I can write a proper guide. Or, can create an video about it. Feel free to Comment. 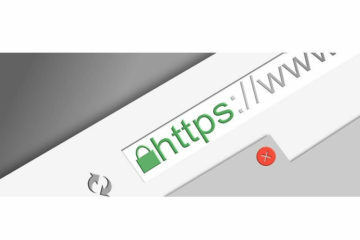 Previous ArticleSolutions to fix ERR_SSL_PROTOCOL_ERROR in Chrome Browser. Next ArticlePermanently Fix Windows 10 Black Screen With Cursor Problem. I did up to step 4 and it worked for me.